Winter has settled over the Earth, Air and Water. It is our inner Fire that holds steady in the night... bringing about the Dawn-ever closer to our true selves. During this period, spoken affirmations are practiced to manifest and secure our power to survive and thrive. To be able to genuinely “go within” and see the possibilities within oneself, clearly. In order to manifest inner truths as absolute truths, we must look inwardly at ourselves without reserve. Finding the spark of God within us that burns with the glory of Herself. 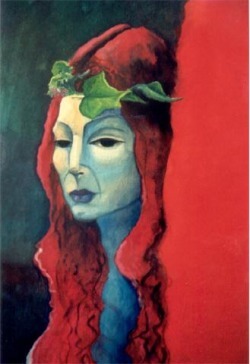 a goddess of germination, particularly vegetation. She was also the goddess of the underworld (similar to Persephone). 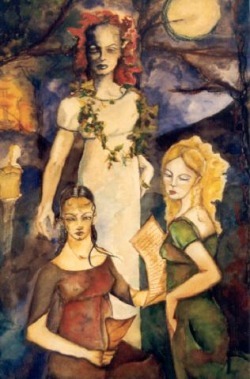 ecstatic worshipers). Ariadne helps us to live life to its fullest; no matter what the Fates have in store for us. Framed in warm caramel wood, engraved with grape vines. Plexiglass. Inquire for photo of frame. Mythologically, the Goddess of nature and abundance. She is the spiritual power that gives life to the land and its inhabitants. Goddess of the green earth—She is sensual, passionate, the embodiment of motherhood and nourishment. Young sprouts rise from the earth and rejoice in the warmth of the sun. Child explores the newness of the world. Glyph represents the arrival of new growth. Flourishing from the light of the sun, Maiden and earth are relaxed in content amusement. Glyph represents full-blown plants receiving the suns light and the cup that summer harvest fills with wine running over at the rim. Autumn Mother awaits as her seed has returned to the earth for a period of dark sleep before the resurrection of life. Glyph represents the cup turned upside down or reversed. The wine has run out and the savior ( seed/Persephone )returns to the earth. Winter Wisdom bared and awaiting a new season of sun and youth ( reincarnation). The glyph represents dormant seeds underground awaiting the warmth of Spring. A representation of emotional bonding through trust and friendship. "Rejoice in your growth, victories, and experiences. The healing of being happy together. Now is an appropriate opportunity for you to create a way of sharing your joy and abundance." The women look upon us with timidity and caution for we have not experienced the trials of kinship. Of so many church bells. Or knocking beads in silent prayer. 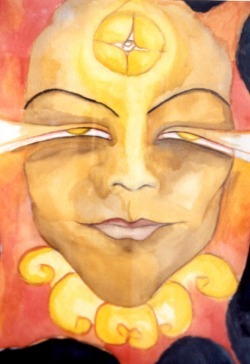 Dedicated to Winter Solstice-Amaterasu will only come out of hiding when we praise Her and Her beauty. We are gifted with the warmth and nourishment that only the sun and love can bring to us. 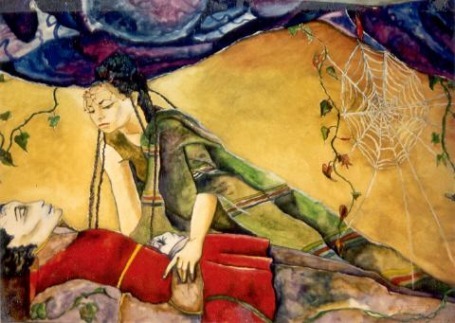 In this updated version of an old tale, the woman as Goddess (Nature) awakens the man (humanity) with the kiss of life. She wears a modern sari mirroring Her mystic presence and splendor. The reciprocal process of life and death. 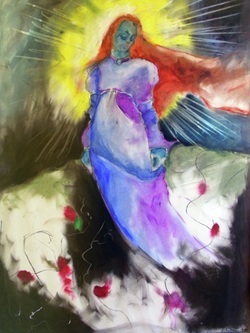 She has come to reawaken the powers of love and beauty in all of us. Stemming from the 3 fold journey of the astrological sign Scorpio; the phoenix rises from the ashes of its lower self-images: Scorpio and Eagle. The Scorpion stings itself to death out of fear and refusal to be hurt by another. Reincarnated into Eagle-a representative of honor, justice and strength, it soars onward to Dove or Phoenix. The epitome of grace, peace and understanding. 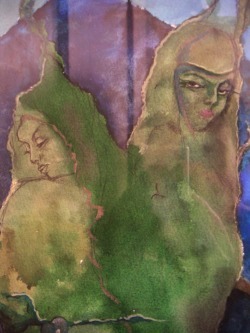 The 2 angels standing in Mountain Pose serve as a symbol of universal strength and grace while in balance with each other. The subtle sense of physical cooperation lends a hand in the upward process of give and take, sharing of oneself and understanding one another's needs. The hands, once connected, form the universal abundance symbol signifying openness and acceptance to all things. According to Arthurian lore, for King Arthur to be fully invested in kingship he had to marry the earth Goddess. 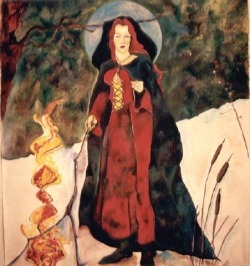 This woman was Gwenhyfar, the ancient Welsh Triple Goddess, the goddess of Dawn and Spring. 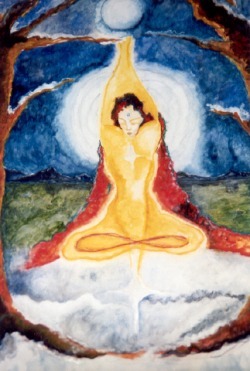 She is the eternal feminine principal. 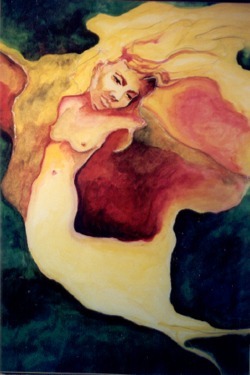 "One-in-Herself", referring to what Esther Harding calls a woman or goddess who is complete in & of herself. Forever in cyclical understanding and holistic union. Yogic posture signifies the hardships of any union with the satisfaction of realizing bliss when all is magically surrendered to. Unity with Oneself are the key meditations of this piece. 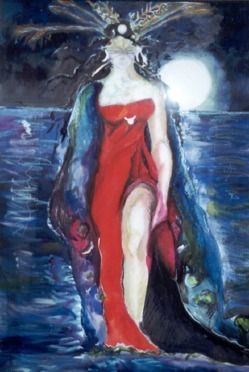 Painting created through meditations accompanied by song from Circle of Soul: "Earth my Body, Water my Blood, Air my Breath and Fire my Spirit"
Magnificent metamorphosis of woman. Rites of passage from inner depths to butterfly, nightingale, angel. Singing in the throes of personal liberation through passion, spirit and enlightenment. Finally at peace with who one is. Catholics see Her as the Moon of the Church. 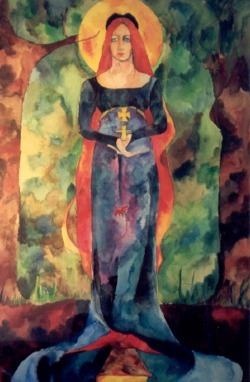 She reigns as Queen of Heaven, the mother of God who lost and regained Her divine son. Much like Buddhism's goddess White Tara, She is the mother of mercy and infinite compassion. A direct descendant of the Goddess on earth. She represents silence, darkness, the mysteries of the Moon. She is the Goddess's representative of all the secrets that no man can ever discover. The deepest subconscious. When the time is right, She takes life away in order that our divine spirit may be free to resume on its journey. Through Her we manifest the Goddess's divine wisdom, stillness, and the ability to use our Intuition. 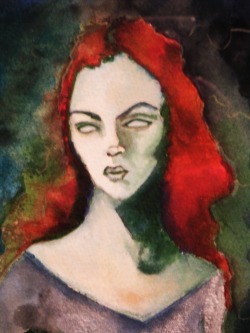 Persephone's annual hibernation in the underworld brings calmness; introspection through meditational non-activity. The archway-a symbol of hope, unknowing, the future (in this case Spring), knowledge soon to be unearthed. Lilith, St. Sebastian (pre-martyred ), and the artist ( in dream/sleep state ) are visited by a raven (not shown) as an omen for the things to come. Lilith invites us to experience the riches of the world, while the sleeper experiences the subconscious, and Sebastian awaits his spiritual journey.